There are many medications available over the counter (OTC) at pharmacies and grocery stores that we consider to be safe, their use to be routine. We don’t think twice about picking up medications to help with pain or flu symptoms. What many people don’t consider is that these same medications can be very dangerous and even fatal for our pets. 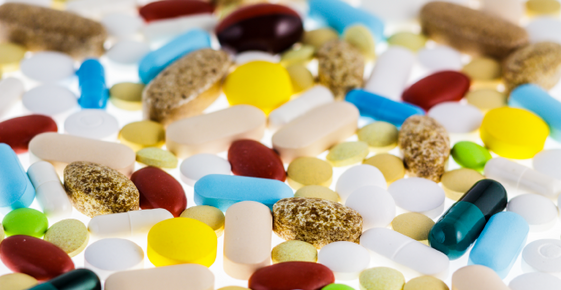 As mammals, humans, dogs, and cats metabolize many medications the same way. Your veterinarian will often prescribe medications that were developed for people for use in your pet. However, there are several classes of medications that don’t work the same way for humans as they do for our pets. The most common class of medications that is very dangerous and easily fatal for pets are non-steroidal anti-inflammatories (NSAIDs). These medications are what people think of as OTC pain relievers, such as acetaminophen (Tylenol), naproxen (Aleve), ibuprofen (Advil) and many others. We see commercials for them all the time that exclaim how effective and safe they are for everyday use. Because of this, owners feel that they must be helping their pets by giving them these medications for injuries and arthritis. Unfortunately, in dogs and cats, these medications are not metabolized the same way, and, in our pets, toxic chemicals are created in the body. These toxic chemicals can cause kidney failure, liver failure, stomach ulcers, and even keep the blood from being able to carry oxygen. With known ingestion, it is important to get your pet to the vet immediately. If too much time has passed and the pet has absorbed the medications or is already showing signs of poisoning, very aggressive therapy is needed and is not always successful. Because human NSAIDs cannot be used for pain management in pets, animal pharmaceutical companies have been successful in developing very effective NSAIDs for dogs and cats that have a lower risk of side effects. These medications are available from any veterinarian. As with any medication, prescription or OTC, it is important to discuss with your veterinarian what medication you want to give your pet and possible side effects to be aware of.